Atrox are enormous, highly territorial, and immensely strong pseudo-homonid shark-descended aberrations that live deep within the forests and mountains of the world. These fortuitously rare and incredibly dangerous creatures make up for their lack of intelligence with terrifying strength and a robust appetite. Atrox are enormous semi-bipedal creatures, standing nearly 5 meters hunched and up to 8 meters standing. Though they have an almost ape-like appearance they are entirely bestial and dull-witted creatures, possessing no discernable language, culture, or planning ability. The extent of Atrox emotions are hungry-rage, and the height of Atrox tool use is uprooting a thick tree to use as a club or heavy boulders to use as projectiles. The latter is only possible due to the staggering power the species are able to summon. 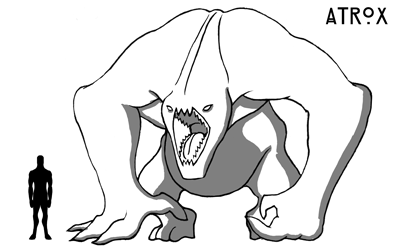 A hungry or angry Atrox is easily able to lift as much as any Clatterjack of equivalent size. They are capable of very short bursts of speed but are generally lumbering and slow over distance. This makes it generally possible to escape an Atrox attack so long as the victim can stay upright and moving. Once an Atrox has captured prey it will either consume it outright or cripple or dismember the prey to eat later. Dissection of specimens suggest that Atrox are a modification on, or terrestrial evolution of, some form of shark species; They share a variety of species traits with sharks, including redundant rows of teeth, rough skin made of helically arranged and flexible collagenous fibers, vestigial gills, and a terrifying propensity to consume prey whole. The composition of Atrox skin makes them durable but difficult to skin or tan. Coloration range is minimal, between dull grey and pale greenish, and often mottled with black. They possess a protective layer of fat that seals over many wounds, allowing them to heal. Killing an Atrox is difficult and typically requires piercing sensitive organs such as the hearts, lungs, or brain. Atrox vocalizations are limited to grunts, growls and a distinctive and deafening roar. The Atrox diet is composed of whatever organic material they currently have access too, but they show a strong preference towards meat. They spend most of their lives sleeping, waking only occasionally to feast on whatever is at hand. Their hunting technique is crude, typically based around scaring prey into dead ends, crippling animals by throwing heavy objects at them, or lying in a torporous slumber until something comes close enough to ambush. Atrox are extremely territorial, even with other members of the species, and will kill interlopers. Their means of reproduction is entirely unclear and there are no reports of young Atrox on record. While reports of the species have been made across Aeldos, they are primarily found in a handful of mountain ranges. While Atrox have proven impossible to train and exceedingly difficult to capture some ambitious bandits have taken to luring them towards trails or outposts, using their natural aggression as a weapon. These marauder Atrox can flip heavy carts with a single hand, or level an entire house within a few minutes, consuming defenders and wandering off, leaving ample bounty for the Bandits. The Oratino Arena in Ossandria and the Strathyre Pit in Ossandria both have Atrox, captured by the renowned Venatores Victa, which they use for arena fights. Historical records regarding the Atrox suggest they were present prior to the Urul Imperium, suggesting that they may have been a celestial creation. Atrox skins are largely useless, prone to fast decomposition and resistent to treatment and tanning. Smaller cave Atrox have been reported by some delvers in the Crux. Atrox demonstrate an innate fear of only three species; Heliar, Faeles, and Roga. In such encounters the Atrox will back down, leaving an area. While the Roga are undeniably terrifying, it is less clear what features of Heliar and Faeles triggers this response.